Colourful, informative, humorous and cosmopolitan, the work of Miroslav Sasek is all over the internet these days. The Czech author and illustrator died in 1980, but thanks to a series of reprints from Universe Publishing, many of his popular “This is . . .” titles no longer languish in obscurity. If, like me, you follow any mid-century design blogs, you’ll already know that these large-format picture books for kids and adult nostalgia buffs are the perfect way to time-travel back to the 60s. 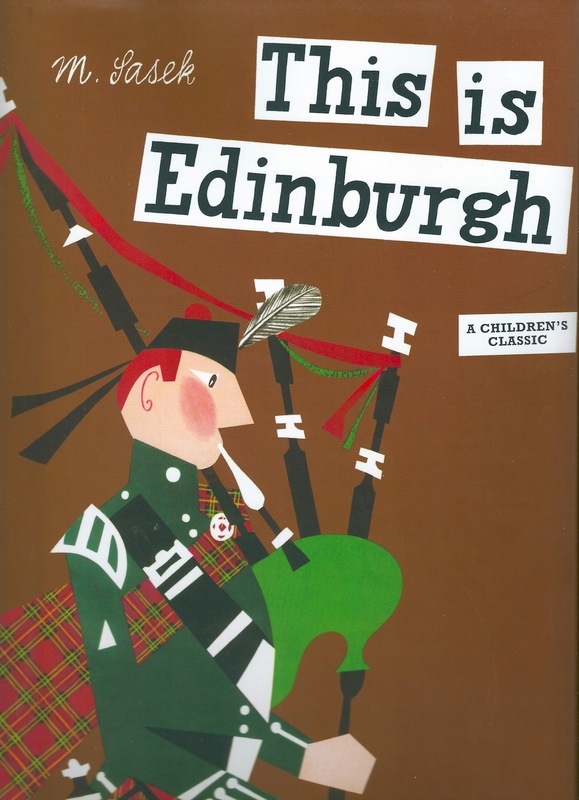 I was particularly pleased to get my hands on a copy of This is Edinburgh, which was first published in 1961 and was apparently one of the author’s favourites. Despite the brown background on the cover, this whistle-stop tour of the Scottish capital’s many ancient monuments is every bit as vibrant as Sasek’s earlier books on Paris, Rome and New York. I moved to Edinburgh in the mid-60s; my brother and sister were both born there. So this Sasek title has more resonance for me than This is London (published two years earlier), because it really was the city of my childhood and where my earliest memories were made. 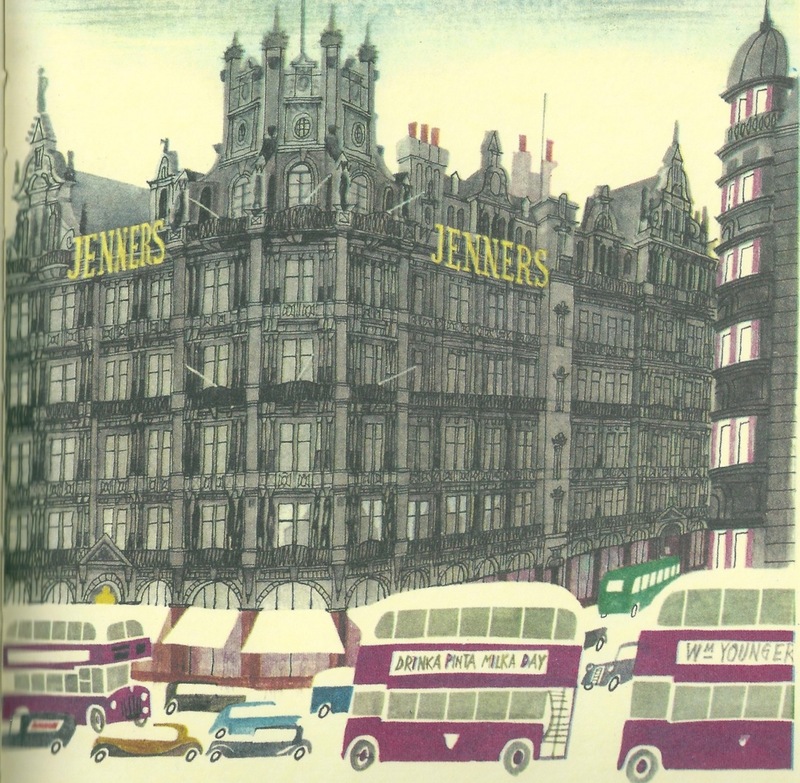 Sasek has included an illustration of the ornate but rather grey facade of Jenners department store, on Princes Street. Now part of the House of Fraser Group, this emporium was where my grandmother took me for my first proper haircut, during one of her visits to the city. The passing bus bearing the “Drinka Pinta Milka Day” advert is a reminder of a famous campaign that began in the 1950s and gave us the word “pinta”. 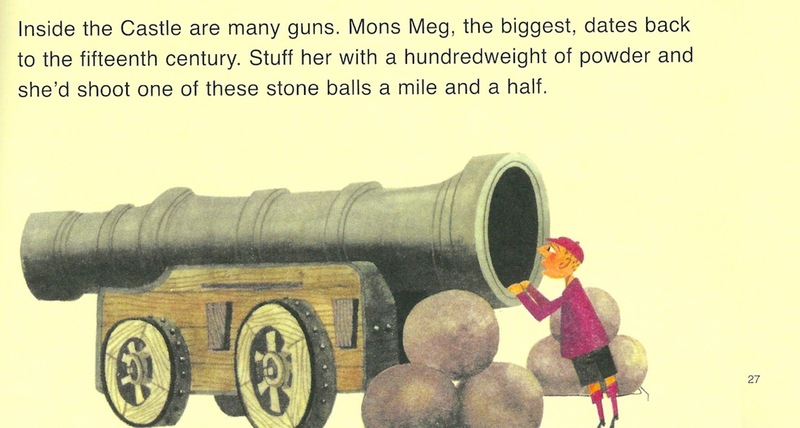 I’m not sure whether I was ever allowed to stick my head so close to the famous Mons Meg cannon at Edinburgh Castle. Even if I did, there are no photos, because phone cameras hadn’t yet been invented. 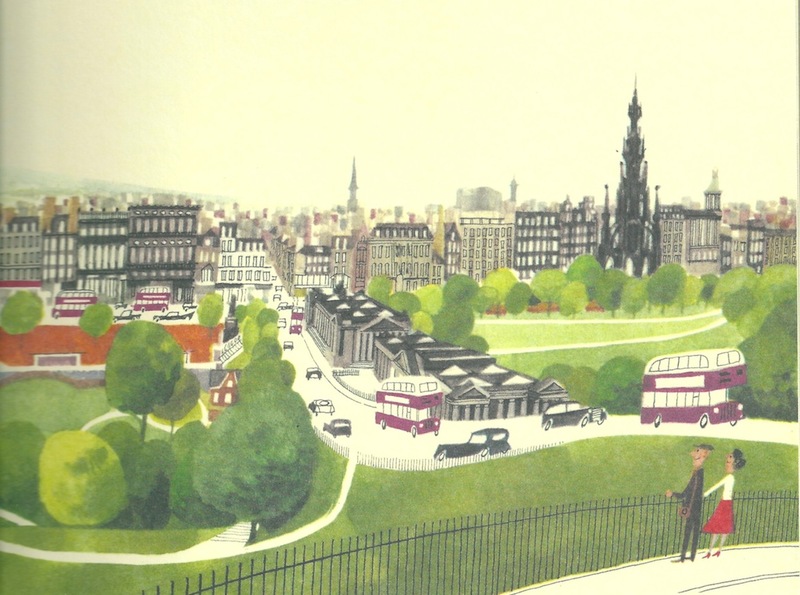 I’ve been in London for 25 years now and I’ve grown to love its many parks, but this image of Edinburgh’s Princes Street Gardens reminds me of some early walks – though I may well have been confined to my pushchair at the time. No visitor to Edinburgh, however lazy, can avoid seeing the Castle as it looms over the cityscape from Castle Rock. 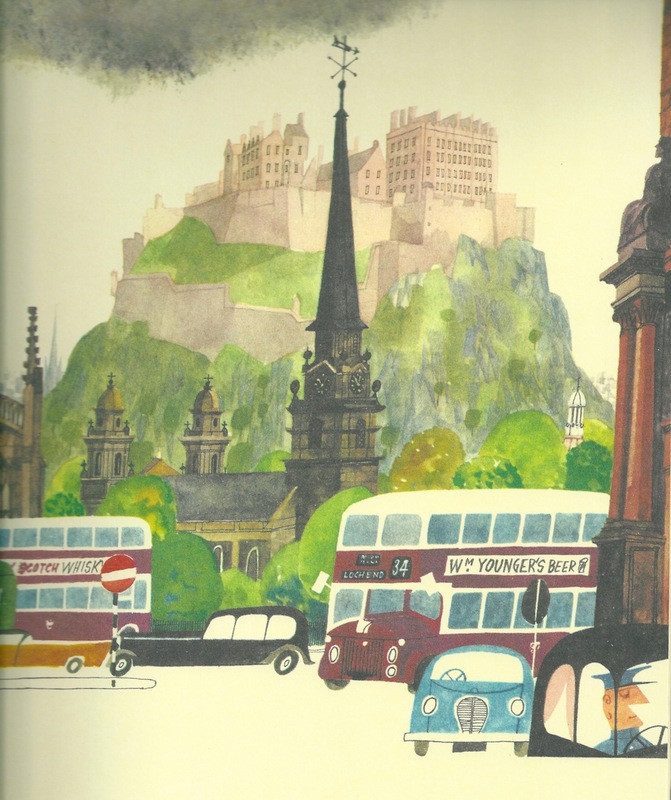 I mentioned earlier that these Sasek books are always colourful, though parts of the cities they depict no longer look modern but gloriously mid-century. In the case of Edinburgh, the text hasn’t required much tweaking for 21st-century readers, since the book focuses so heavily on the city’s history. Along with the bagpipes, tartans and attractive gardens, I’m glad to see that Sasek has also found space for plenty of trademark grey clouds (see above). As my mother will testify, Edinburgh in the 60s was frequently gloomy in a meteorological sense and we didn’t have the benefit of HeatTech undergarments. So she wasn’t too disappointed when we got on a plane and flew south – for good – in the summer of 1969.